Reiki is a powerful tool for physical, emotional, mental and spiritual healing that adapts to our individual needs and the needs of the recipient. Reiki is one of many techniques that can help us to reconnect to our true selves and aid us in our healing journeys. It supports the recovery of health and wellbeing and personal and spiritual growth. Reiki I – Is an introduction to the Usui system of natural healing. During the course you will receive Background information about the technique and about utilising the life force energy. It will equip you with the basic healing techniques and hand positions of Reiki for treating yourself and others. The workshops are 2 days and in a small friendly groups of 4 - 8 people. There will be attunements by a Reiki Master together with background information, yoga, guided meditations and an opportunity to practice some self-healing and healing treatments on others. Upon completion you will be able to use the techniques for self-healing and on family and friends. You will receive a comprehensive manual of information to take away and full certification. It will be a lovely nurturing weekend that will begin your Reiki journey and giving you the opportunity to engage in some me time and personal growth and meet other people who want to do likewise. For anyone who is interested in personal development or helping others. Cost: £160 per person for 2 days. Please contact me to express your interest and find out about upcoming classes. 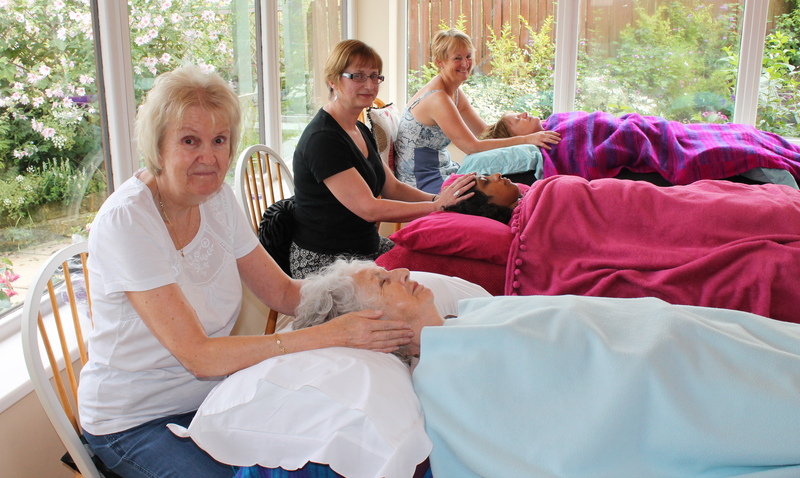 In this 1 day course we will recap the more practical elements of the Reiki I course. This is particularly beneficial if you have not used Reiki since your attunement or have not had much chance to practice on others or if you just want an extra opportunity to immerse yourself in the Reiki energy! There will be yoga, a guided meditation, a further Reiki I attunement (remember each attunement strengthens and enhances the Reiki flow), and an opportunity to practice chakra balancing and some self-healing and healing treatments on others as well as the chance to receive some healing yourself. There will also be time to ask questions and discuss any further support you may feel you need. It will be a lovely nurturing day that will give you the opportunity to recap anything from Reiki I. For those who have received training and a Usui Reiki attunement at first degree (level 1) or above. Cost: £100 per person for the day (A further cost of £10 will be charged for an Aspire to be Reiki I manual if you have learnt elsewhere and would like one of these). Please contact me to express your interest and find out about upcoming classes. Reiki II is a two-day course introducing that will introduce you to the sacred symbols of Usui Reiki. These are very powerful symbols which will dramatically increase and enhance the potency of the Reiki energy. You will receive a further attunement which will significantly amplify the amount of Reiki energy channelled through you. As a result of this attunement, students normally develop both a greater sensitivity to energy and their own psychic awareness. The main subject of Reiki II is the learning of distant healing techniques, which enable you to send Reiki energy over long distances – even around the world and through time and space; and mental and emotional techniques and their symbols, which support the release of emotional and mental energy blocks. In short you will learn how to further empower yourself and reach higher states of consciousness to enhance your personal growth. As well as a second degree attunement, there will be yoga, guided meditations and an opportunity to practice some self-healing and healing treatments on others. Upon completion of the workshop and practitioner requirements you will be able to use the techniques to set up a business and take on paying customers. You will receive a comprehensive manual of information to take away, including some information about setting up in business and full certification. It will be a wonderful empowering weekend that will give you the opportunity to enhance your Reiki potency and engage in further personal growth and meet other people who want to do likewise. Reiki II for Personal Development - In order to receive your Reiki II attunement it is ideal that you are that you are working with the Reiki energy on a regular basis for yourself - If you are doing Reiki II for your own development then this is sufficient. Reiki II to see paying clients - If you intend to treat paying customers then it is key that you have given some treatments to family and friends (I would suggest a minimum of 8 treatments). It is ideal to have given some treatments to people you know less well, so you can experiment with developing your intuition. Cost: £200 per person for 2 days. Please contact me to express your interest and find out about upcoming classes. Masters Level Reiki is for those students who wish to become teachers; those who want to use the additional attunement for their own personal development and spiritual growth; or those who wish to use the additional three symbols to increase the potency when channelling Reiki. The Reiki Master Teacher attunement includes the Usui Reiki Master symbol (which brings with it soul healing and a significant leap in spiritual awareness, enhancing the strength and power of the other symbols) plus the Tibetan Master symbol and a special attunement symbol. The course further develops the skills from the previous two degrees and teaches some additional techniques. As well as a third degree attunement there will be yoga, guided meditations and an opportunity to practice some self-healing and healing treatments on others. Upon completion of the workshop you will be able to use the additional symbols for yourself or others and use the techniques attune other people to Usui Reiki. You will receive a comprehensive manual of information to take away and full certification. It will be an amazing weekend that will raise your vibrations further and give you the opportunity to enhance your Reiki potency, engaging in further personal growth and opening the door to spreading and sharing Reiki further. For those who have received training and a Usui Reiki attunement at second degree (level 2) or above. Reiki Masters for Personal Development - In order to receive your Reiki Masters attunement it is important that you are that you are working with the Reiki energy on a regular basis for yourself - If you are doing Reiki Masters for your own development then this is sufficient. Reiki Masters to attune other Students - If you intend to begin Reiki attunements then it is key that you have given some treatments to family and friends or paying customers (I would suggest a minimum of 16 treatments) and have received some treatments and completed your Reiki II practitioner requirements. It is ideal to have given some treatments to people you know less well, so you can experiment with developing your intuition. Cost: £350 per person for 2 days. Please contact me to express your interest and find out about upcoming classes. In this 1 day development course we will undertake some activities to enhance personal growth, intuition and share Reiki. This is particularly beneficial for those of you who want an extra opportunity to immerse yourself in the Reiki energy and expand your Reiki knowledge and experience and share experiences with each other! There will be yoga, a guided meditation, exercises to practice enhancing your awareness and intuition, a chance to develop your Reiki knowledge and experience and an opportunity to give and receive some healing. There will also be chance to share experiences and receive support. It will be a lovely nurturing day that will give you the opportunity to take a break from your busy lives and engage in a bit of me time and Reiki healing and meet other people who want to do likewise. For those who have received training and Reiki attunements at first degree (level 1) or above through any lineage, you are welcome to join. Cost dependent on number and location. Please contact me to express your interest and find out about upcoming classes. If you need a recap on the hand positions or anything covered in any of the manuals. If you need someone to practice on. If you have any questions about any of the workshops, about anything you may be experiencing after your attunement about self-healing experiences or about experiences when treating others. If you need someone to practice on in order to complete your Reiki II Practitioner Requirements. If you have received Reiki attunements at first degree (level 1) or above with me then this support is available for free.